Welcome! This is a blog showcasing flower photography. I always enjoy photographing blooms, as do many other photographers! The rules for posting are simple! 1. Every Friday post a photo that includes one or more flowers. 2. Please only post photos you have authority to use. 4. Leave the link to your FloralFridayFoto post below on inlinkz. 5. Visit other blogs listed ... comment & enjoy! inlinkz will be available every Thursday and will remain open until the next Wednesday. The garland chrysanthemum (Chrysanthemum coronarium syn. Leucanthemum coronarium) is a species of flowering plant in the aster family, Asteraceae. It is native to the Mediterranean and East Asia. It is used a leaf vegetable. Other English language common names include chrysanthemum greens, edible chrysanthemum, chop suey green, crown daisy, and Japanese-green. 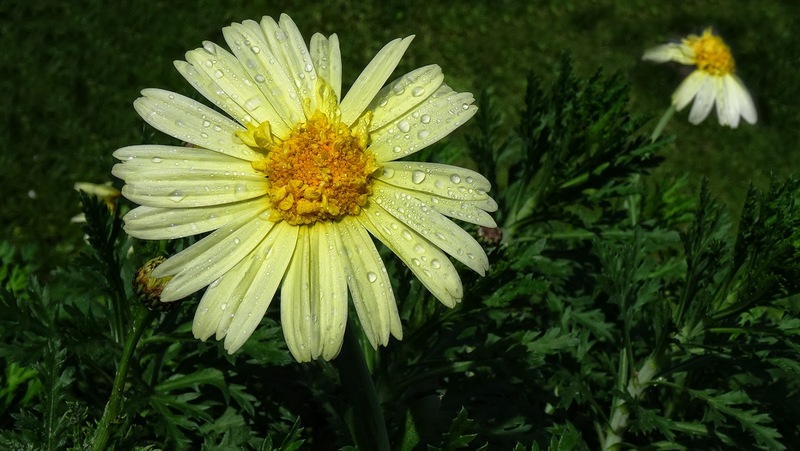 A leafy herb, the garland chrysanthemum is one of the few annual plants in its genus. It has yellow ray florets grouped in small flower heads and aromatic, bipinnately lobed leaves. The vegetable grows very well in mild or slightly cold climates, but will go quickly into premature flowering in warm summer conditions. Seeds are sown in early spring and fall. The plant is rich in minerals and vitamins with potassium concentrations at 610 mg/100 g and carotene at 3.4 g/100 g in edible portions. In addition, the plant contains various antioxidants (in stem, leaf,and root tissues) that have potential long-term benefits for human health, although toxic (dioxin) properties have also been observed. Extracts from C. coronarium var. spatiosum have been shown to inhibit growth of Lactobacillus casei, a beneficial human intestinal bacterium." The plant’s greens are used in many Asian cuisines. They appear in Cantonese dishes and Hong Kong cuisine in stews, casseroles, and hotpots. The leaves are also an important ingredient in Taiwanese oyster omelettes and, when young, are used along with stems to flavour soup and stir-fry. In Japan, it is used in nabemono. Korean cookery uses the greens in soups, stews, and alone as a side dish or (banchan). In a hotpot, it is added at the last moment to the pot to avoid overcooking.In Crete, a variety of the species called mantilida (μαντηλίδα) has its tender shoots eaten raw or steamed by the locals. Join me for Floral Friday Fotos by linking your flower photos below, and please leave a comment once you have done so! Attractive, dense ferny foliage makes Polemonium pulcherrimum 'Blue Dove' (also known as Jacob's ladder) a valuable plant for all year round interest in the garden. As an added bonus loose sprays of open bell shaped flowers in a soft shade of blue can appear from spring right through to and including autumn. Its 'lacy' appearance makes it a useful plant for softening hard lines and edges created by rocks, garden edging or paving. 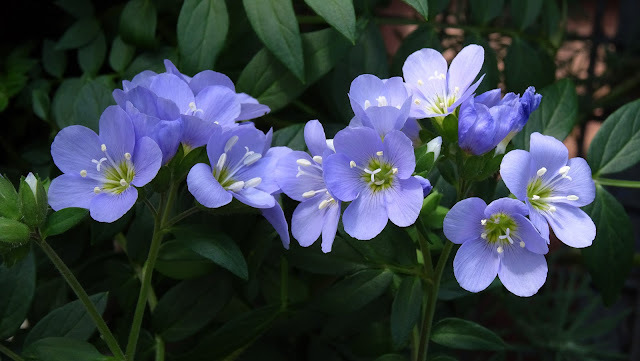 Polemonium is a genus comprising of around 30 species of mostly perennial herbs which are native to regions of North and Central America, Europe and Asia. An excellent plant for general garden use and suitable for most colour schemes. 'Blue Dove' looks particularly at home in woodland type settings or in the cottage garden. It may be grown in semi shade although this may decrease flower production. This, however, is not necessarily a reason to avoid planting it in such locations as the attractive foliage alone will lend a visual appeal to these often difficult landscaping zones. To accent the foliage further create a foil of foliage behind it using larger, broader leafed plants or those with tall slender foliage such as that of Irises. Osteospermum is a genus of flowering plants belonging to the Calenduleae, one of the smaller tribes of the sunflower/daisy family Asteraceae. The common name is African daisy or Cape daisy. Osteospermum used to belong to the genus Dimorphotheca, but only the annual species remain in that genus; the perennials belong to Osteospermum. The genus Osteospermum is also closely related to the small genus Chrysanthemoides, such as C. incana and C. monilifera. 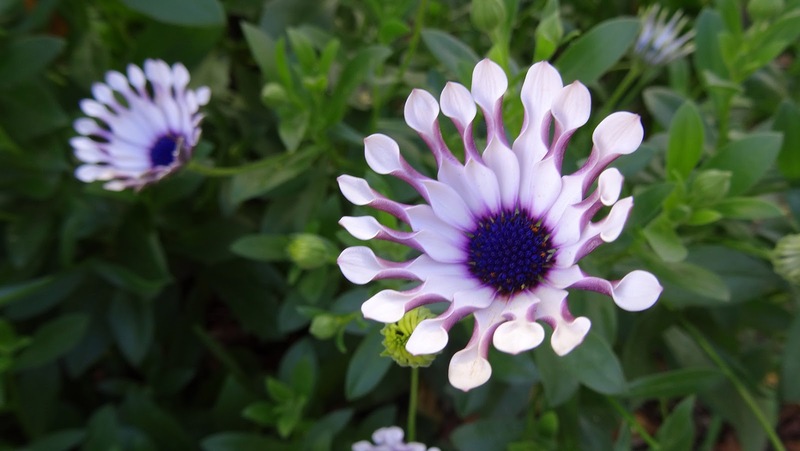 Osteospermum ‘Whirligig’ is referred to as a “spoon” type of hybrid where the tips of each petal is scalloped and rounded in shape. 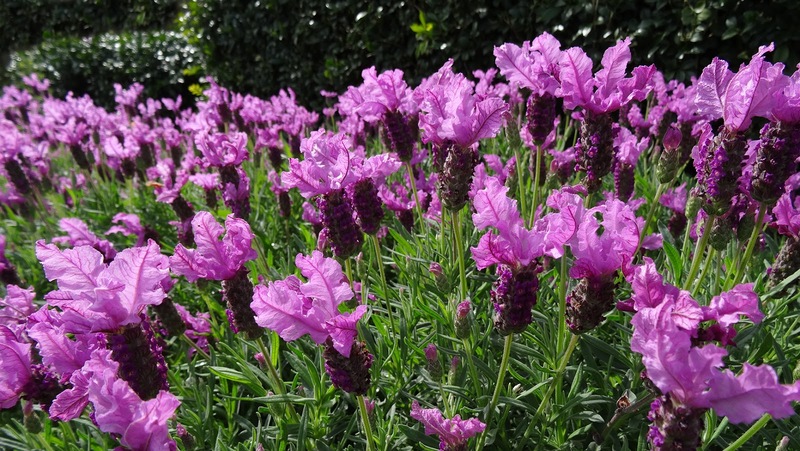 Lavandula spp "Princess Lavender" is an early flowering, fragrant Italian lavender cultivar. Bred in Australia and selected for its large, vibrant, dark pink flowers, it has a lengthy flowering season. The main flowering flush begins in spring but the plants also free flower throughout the autumn and winter months. It has a neat, compact habit with aromatic foliage. Flowers last well for floral arrangements and it is hardy and easy to grow without any special needs. Once established, the plants are quite dry tolerant requiring only occasional deep watering during extended periods of heat. They should be planted in a sunny location in a well draining soil. Clip back to two thirds of overall size in late summer to maintain shape and vigour. After pruning an application of slow release fertiliser and a light sprinkling of dolomite lime over soil would be beneficial to overall performance. HAVE YOU VISITED MY OTHER BLOGS?